Face Painting for Everyone….not just kids! Spring is right around the corner and what are some of the things that come to mind that your kids will be soooo looking forward to? 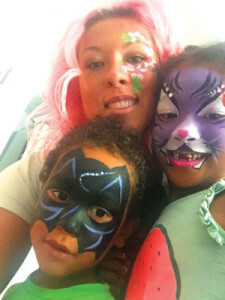 Carnivals, the beach, vacations AND that one thing that is at every family friendly event, FACE PAINTING! Let’s all join in the fun! As a mama of 2 little ones, something I always try to do is enjoy the special moments with them, and that often means participating in what they are experiencing. Let’s be real, parenting can be extremely difficult so when there is a moment to feel like a kid again with no judgement or hesitation then I don’t know about you but I’m all in! My intention this year is all about bringing together community. Connecting with new people, having a ton of fun and letting go of the way things “should” be done and rather doing it the way you “want” to. I notice every time we do an event that the adults hesitate to sit in the chair to have their faces painted. They often ask if it’s ok, and the answer is OF COURSE! If we can enjoy experiences by participating in them, not just “for” our kids but “with” our kids, I can bet those memories will be even more vivid as they grow, and memories start to fade. So, this spring after all that time waiting in line (it’s always a long one…) why not have some extra fun and have a seat yourself. We have many options that are sweet for the adults too!